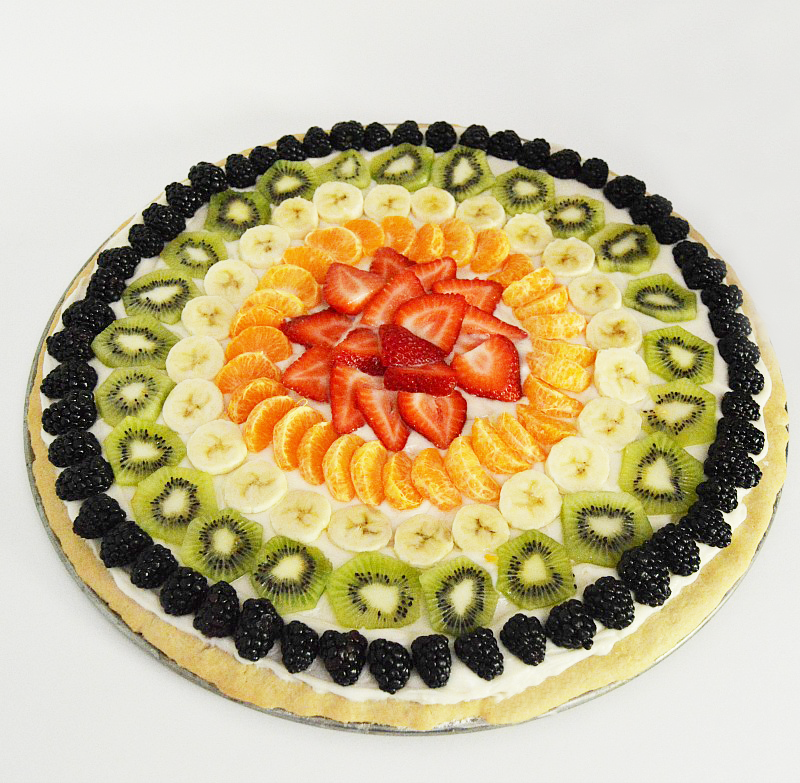 A fruit pizza is one of my favorite dessert recipes. So easy and versatile, you can use any cookie & frosting recipe that you like and change up whatever fruit you have handy. For this recipe, I used a cheesecake cookie recipe with a cream cheese buttercream that is awesome with fruit. When I made this fruit pizza, I had small oranges on hand. At first, I wasn’t sure if the oranges or even the bananas would taste good. They did! The oranges tasted like an orange creamsicle popcicle and the banana reminded me of banana pudding pie. You could use any fruit you like, I switch it up every time I make it. Sometimes I use a sugar cookie recipe with basic vanilla but use any chance I get to add cream cheese to a recipe. In a medium bowl whisk flour, salt, and baking powder and set aside. In the bowl of a mixer blend cream cheese and butter until smooth. Add sugar and mix well on low speed. Keeping mixer on low speed add vanilla, lemon and eggs blending each egg well. Lastly add flour mixture in small amounts and mix until blended well. Wrap in parchment paper and refrigerate dough at least two hours. Refrigerate dough for at least two hours before handling. This dough is sticky, when dough is chilled and you are ready to handle use a floured surface and floured hands. This dough is perfect to spread onto a pan and cook as a pizza, it is not a roll out dough. Use a lot of flour to handle and form onto a greased pizza pan. I used a regular metal pizza pan for this recipe. I also cut and shaped parchment paper to fit and line the baking sheet. Cook dough at 350 degrees on the top rack for about 15 – 20 minutes or longer depending on each individual oven. When the edges are golden and the top is set it is done. Remove form the oven adn let cool on the pan, this will let it continue to cook for another minute or two. You can cut a small piece in the center to check if its done.if you like. Frost cookie when it is completely cooled. 5–6 cups of confectioners sugar or more. In a mixer on low-speed blend butter and cream cheese until smooth. Add vanilla and milk and blend well. Slowly add confectioners sugar in small amounts until frosting reaches desired consistency.